Short, long, or in-between there is a hemline that fits you perfectly. While you may have your favorite length of hem to wear, at times you’ll have to sacrifice personal taste for other things. We know everything is not appropriate for everyplace or occasion. Therefore, if you are unsure about which hemline is best to wear for a specific situation then read on for a quick guide on hemlines. Mini: This length is mid-thigh or shorter. The shorter is typically referred to as a micro mini. Knee-Length: This refers to a hem that falls at, or two-inches above/below the knee. Midi: A hem that falls around mid-calf. Maxi: A hem that falls an inch above the ankle or lower. There are different industries out there. Each has a standard dress code, whether it is an actual uniform or a set of clothing that is deemed appropriate to wear while on the job. If you work in the fashion or entertainment industry, chances are that hemlines are not going to be much of an issue unless you are on the corporate side of these industries. For most blue- and white-collar jobs, your hemline does matter. Your target hemline should be between knee-length and maxi length that fall short of touching the ground. Casual can be anything from average your average lazy day to a low-key date night. As such, you can pretty much wear whatever hemline you feel is right for you. Just make sure that you can wear it with confidence no matter what the opinions of others may be. Semi-formal affairs typically can take hemlines from a standard mini hemline to midi length. Anything shorter may be in poor taste, anything longer may be considered too formal (and you might look out-of-place). For formal affairs, you can get away with knee-length. However, maxi and longer hemlines are best for formal events. I personally would not recommend a mini or shorter unless you are a celebrity and even they are blasted at times if they walk down the red carpet in one. Overall, you decide what you want to wear. However, just be mindful that certain situations may require you to adjust your personal style. So choose the hemlines that are right for you for all of life’s situations. 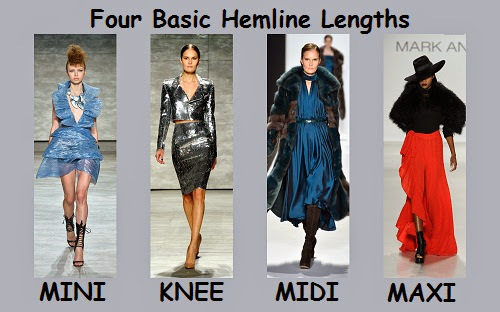 If you have questions about the appropriate hemline length, just comment and I will be happy to help!